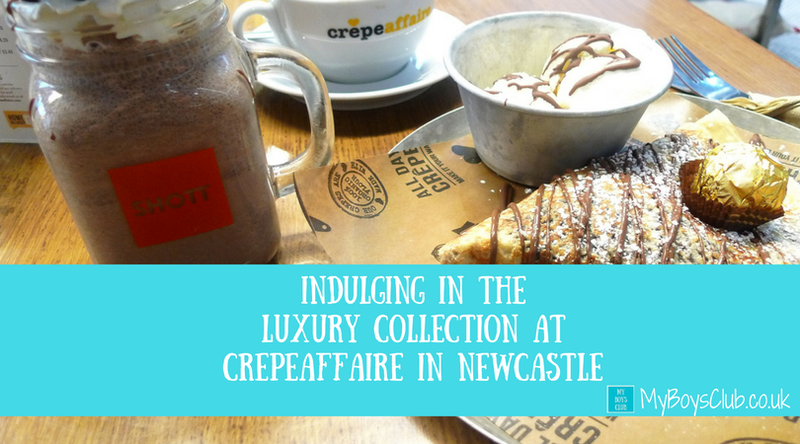 Tucked away under the escalator in intu Eldon Square in Newcastle, you'll find Crêpeaffaire. A small crêperie where you can enjoy freshly prepared French-style crêpes, whatever your craving, at any time of the day. The restaurant is also celebrating its first birthday this week after opening in the recently developed Greys Quarter of Eldon Square a year ago. 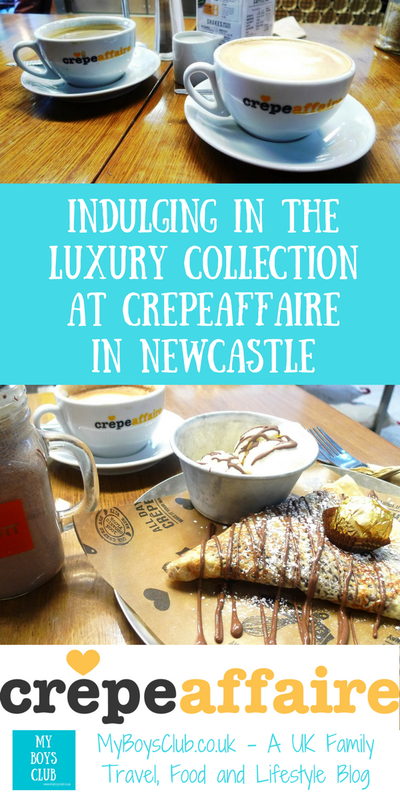 It was also one of our significant anniversaries last week, so hubby and I were delighted to receive an invitation to try out the new Luxury Indulgent Crêpes and Shakes that are now on offer at Crêpeaffaire in Newcastle. A crêpe is a type of very thin pancake and apparently were created 7,000 years BC. Here in the UK, however, we are more used to eating pancakes on Shrove Tuesday but they are also served daily in the 15 Crêpeaffaire outlets across the UK, including this one Newcastle-upon-Tyne. Crêpeaffaire Newcastle is open Monday to Saturday from 9am–8.30pm and Sunday from 10am–6pm. Inside it is designed to be open plan, with ample cosy seating arranged around the central food and service area where you can all of the food being prepared. Although within the intu Eldon Square Shopping Centre, the external windows do look outside on to Clayton Street and over to the Grainger Market. You can choose from wheat flour crêpe or a gluten-free buckwheat galette. And both are made with 100% organic flour and natural ingredients. The menu has both sweet and savoury crêpes. Savoury crêpes include Pesto Mozzarella, Super Veg and Le Goat Deluxe, as well as chicken and ham options too. There are also breakfast crêpes with Eggs Florentine and Eggs Royale really catching my eye. There are waffles too and mini pancakes, but it as the sweet crêpes we were there to try. And in particular the brand new Luxury Indulgent Collection. We are really talking luxury with this collection. Think indulgence, think taste sensations and food satisfaction. There are six new luxury crêpes and four new luxury milkshakes in addition to the regular menu. One of my favourite chocolates was on the Crêpes menu - Ferrero Rocher - so it was easy to choose. I was however also tempted by the Oreo Cookie Opulence, Apple Crumble, Salted Caramel Popcorn Splendour, Banana Tun & Raisin and even more so by the Reese's Peanut Butter Pie. I was very pleased when hubby opted for this one, meaning I could try both! The Ferrero Rocher Extravagance in the luxury indulgence range has a Crêpe filled with Nutella and walnuts, an actual Ferrero Rocher on top served with cream or ice cream. The Reese’s Peanut Butter Pie has Nutella and peanut butter filled crêpe, topped with a Reese's mini peanut butter cup, crushed peanuts and served with cream or ice cream. Both were rich, delicious, filling, tasty and I'd love to eat them again. Just not straight afterwards. They are fairly high in calories, but for an indulgent range of dishes, this is to be expected. To complement the new Luxury Indulgence range, Crêpeaffaire has also introduced an assortment of luxury shakes. These include my choice of the Salted Caramel Popcorn Shake with vanilla ice cream, popcorn and salted caramel; hubby's choice of an Oreo Cookie Shake, made with chocolate ice-cream, cookie crumb, cream, Nutella drizzle, Belgian chocolate chips and an Oreo cookie. There is also a Reese’s Peanut Butter Milkshake and a Homemade Apple Crumble Milkshake. All of them have really opulent fillings and ingredients. They were really tasty, looked great and complemented the crepe beautifully, but if I am honest either a shake or a crêpe would have been enough. At over 500 calories each I wouldn't be drinking them every day but they were both delicious and lovely for a special treat. The whole experience was fun, relaxed and memorable. Pure luxury and indulgence were definitely on the menu. The service was also great. Friendly, informative and courteous staff throughout. When ordering we were made aware that it could be a 15-20 minute wait for our order to be cooked. We sat down prepared to wait, with our fairtrade coffees, however, the food arrived quicker than the estimated time. At first glance the prices seem quite high, however, I just hadn't realised how filling one of the crepes would be. One is definitely enough, but it would be easy to over-indulge. Indulgence means an occasion when you allow yourself to have something enjoyable. This was. It can also mean treating someone with special kindness. Hope hubby enjoyed our celebration too! So with fairtrade coffee, organic flour, gluten-free options to what's not to love about Crêpeaffaire. You could say it's flipping awesome! As I mentioned earlier it is Crêpeaffaire Newcastle’s 1st Birthday week, and if you are in the store this week you may be one of the lucky recipients of a free crepe vouchers - with 10 being given out randomly - and if you order a crepe after 5pm on Thursday 23rd November, you will receive a glass of Prosecco on the house! What's your favourite crepe filling? Disclosure: We received complimentary crepes and shakes in return for an honest review. All words and photographs are my own.